Franco helped us sell our townhouse this March. We had gotten his name from a number of sources when we were asking around for a good and reliable Realtor®. We are so happy we decided to work with Franco. He is honest, confident in his abilities, hard-working, and market savvy. He gave us good advice and we were very happy with the outcome. 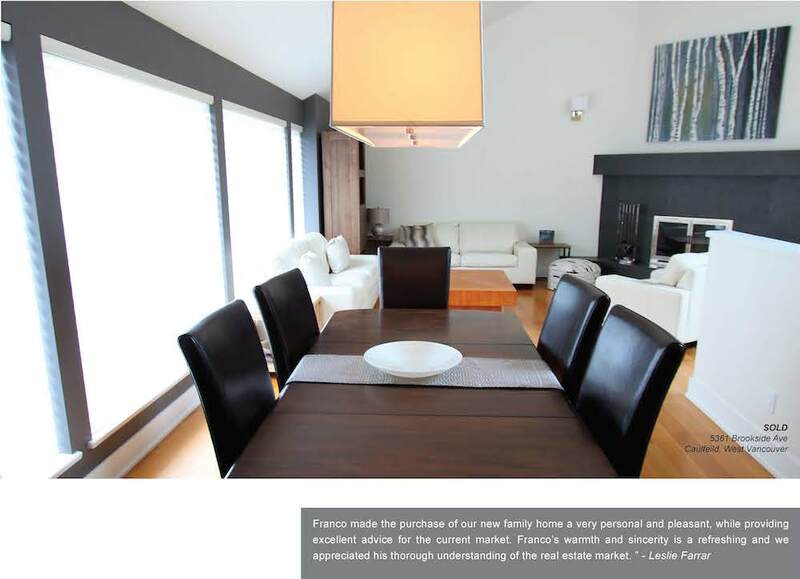 We have already recommended Franco to two other people who are selling their homes. We’re sure that they’ll be as happy with Franco as we were. Franco, my Father and I would like to formally thank you for your outstanding services you provided us this summer. Our situation was somewhat unique and involved long distance communication across several time zones but you were always available and always prompt in your response to all communication. Most importantly, you were thorough in laying out all of our real estate options from the very beginning and you were respectful of all of our preferences and requests. 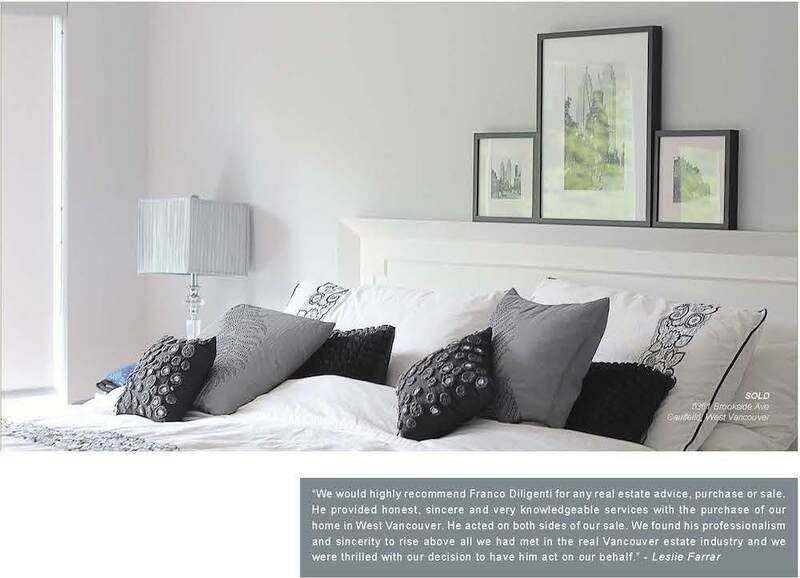 We would enthusiastically recommend you to anyone looking for expert services to buy or sell real estate in West Vancouver. 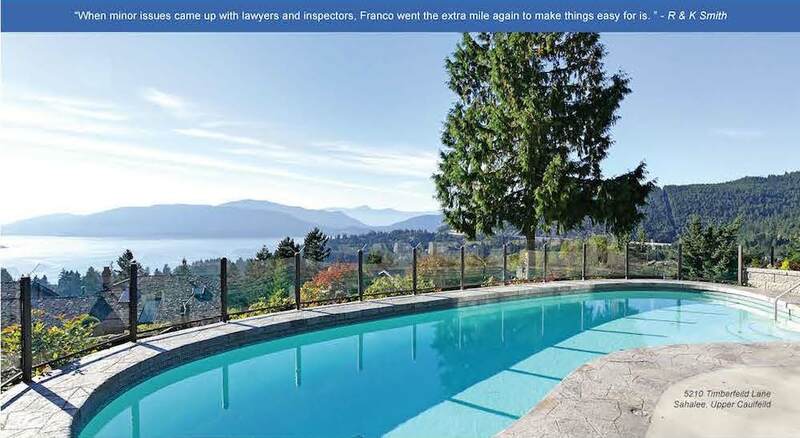 We were fortunate to meet Franco when looking at homes for sale in Sahalee. His helpful and professional manner impressed us from the start and we discussed with him our plan to downsize from our present home. 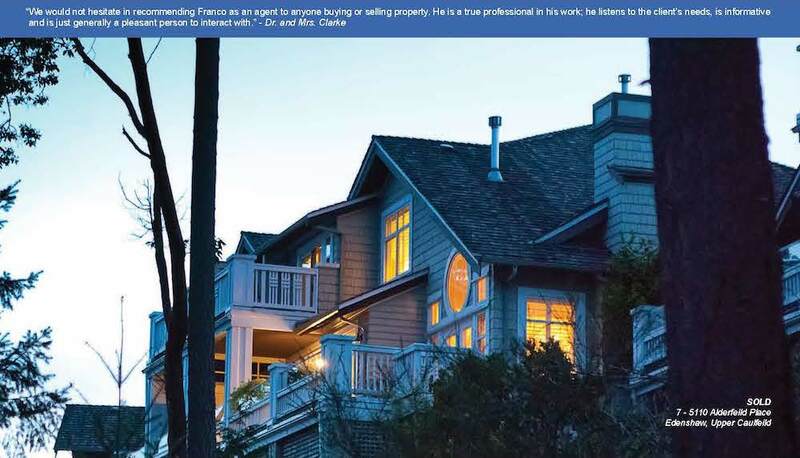 After looking at a number of homes with Franco's expert help, we found our new home in Sahalee. He handled all the negotiations in an efficient and open manner, including the sale of our present home in a competitive market in Caulfeild. He was also a great help to us with respect to preparing our home for sale. His advice with respect to clearing out our house and actually downsizing was invaluable. We have no hesitation in recommending him as a very professional and knowledgable agent. After looking at a number of homes with Franco's expert help, we found our new home in Sahalee. He handled all the negotiations in an efficient and open manner, including the sale of our present home in a competitive market in Caulfeild. He was also a great help to us with respect to preparing our home for sale. His advice with respect to clearing out our house and actually downsizing was invaluable. We have no hesitation in recommending him as a very professional and knowledgable agent. Just a short note to tell you how delighted we both are with our decision to have you as our Realtor. You quickly zeroed in on our wish to downsize, and were able to not only show us a town home in the development we were interested in, but located a unit that was yet to go on the market, and we were able to conclude a purchase for our 'dream' townhome. But that was just the beginning! You were most helpful in walking us through the steps we needed to take to make our house presentable for sale. You also provided us with a list of your services where you could assist us in preparing our house. Determining the correct selling price is obviously a key, and again your insight into the market in our area was most helpful. We were astonished that our home had multiple offers, and sold the first day it went to market, for in excess of the asking price. It is surely a tribute to the preparations and attention to detail that you provided. You were also most helpful in assisting with our move to the townhouse, and the resources you put us in contact with were excellent. 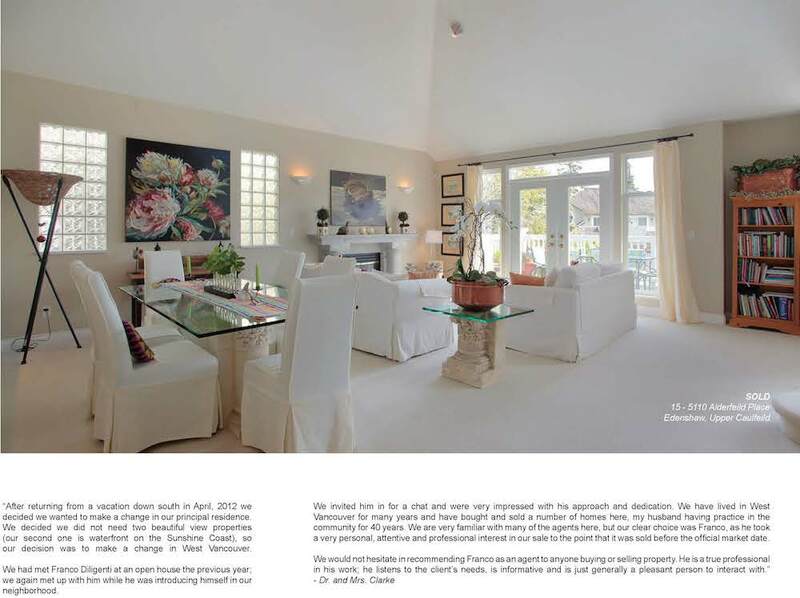 When we put our Caulfeild family home on the market this year, we went for a big-name real estate agent in West Vancouver. The house sat unsold, for months, rarely visited. Upon a friend's recommendation, we decided to switch to Franco Diligenti. He devised a plan to sell the house, implemented his ideas and the house was sold within two weeks. In our experience, why hire anybody else.